Above you will see my forecast for the winter storm that is on our doorstep. I went out on a limb with this storm and forecasted higher totals than what most forecasters are calling for. Why? Let me explain…The computer models are just a guide. If you follow them too closely or copy them word for word then disasters happen, like the major storm back in December of last year. With that storm it was supposed to rain for 6 hours and then change to heavy snow. What actually happened? It snowed the entire time and never changed to rain. We had over 2 1/2 feet when it was over. I have never felt worse as a meteorologist in my career. Not because I obviously got the forecast wrong. I felt horrible because people weren’t prepared. I have learned from my mistake last year. If there is potential for a foot of snow, I am going to say so. That doesn’t mean I am going to “over-forecast” my snowfall totals whenever we have a chance for a foot of snow. I will use my judgement and experience to decide when to forecast more snow than most people believe. I can promise you one thing though…. I feel that the chances of being unprepared for a major storm are a lot smaller now that I have learned from the past. Remember, if you do not learn from the past, you are doomed to repeat it. 1. Heavy snow will happen in waves tonight from southwest to northeast. 1-2″ per hour snow burts will occur. I am very confident about that. 2. A mix or changeover to sleet/frz. rain is possible for southern counties. If that happens then the snowfall totals will come down but the conditions will be far worse. That is why i am calling this a “major localized event.” We dont need to see 2 1/2 feet of snow to have a major storm. even 4-8 inches of heavy snow with .25″ of ice can be major, especially if it falls right at morning rush hour. 3. the models are trying to develop a weak secondary storm in the wake of the first main storm. If that happens a few more inches of snow will be added at the end. 4. This storm is not like anything we have seen yet this season. 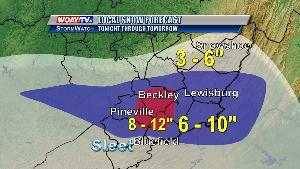 It will be relatively heavy snow, possibly bringing down power lines, especially with ice. I do not see plain rain moving into most areas. We shall see what actually happens…. This entry was posted on December 16, 2010 at 12:22 am	and is filed under weather. You can follow any responses to this entry through the RSS 2.0 feed. You can leave a response, or trackback from your own site.